Silky feel, brilliant tone, and incredible string life. Gauges: 10-14-24w-30-38-47. 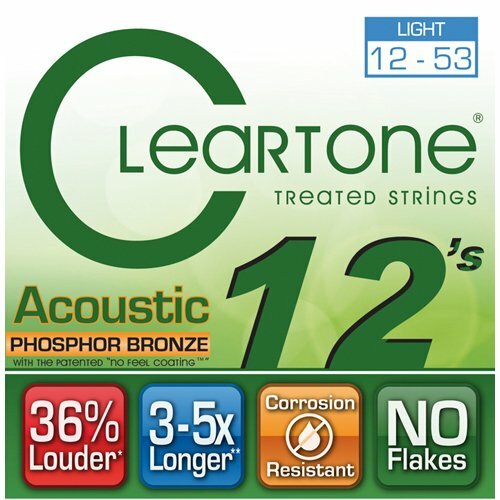 Cleartone Coated Ultra Light Acoustic Guitar Strings feature the Cleartone-patented EMP, Enhanced Molecular Protection. 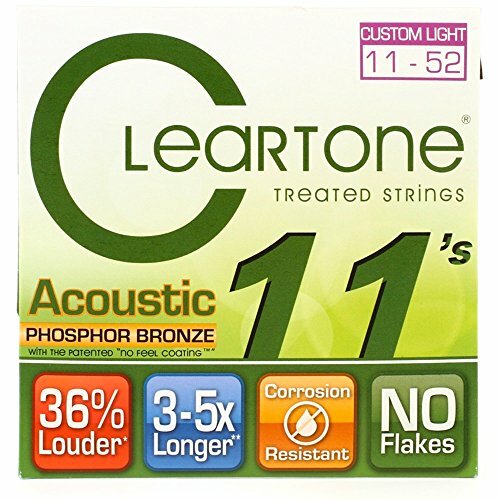 This technology makes Cleartone guitar strings unique. 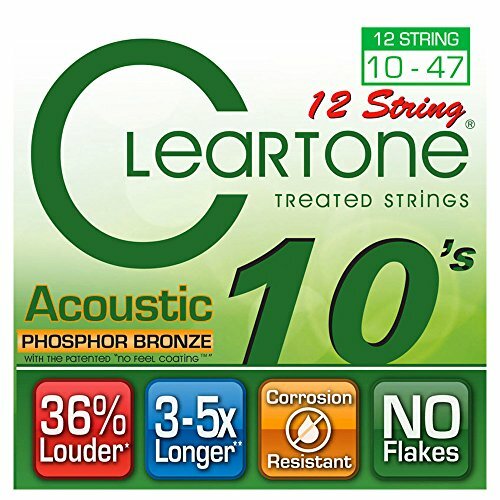 With a coating just 500 nanometers thick, Cleartone gives you unbelievable clarity, and your strings will last 3-5 times longer than a standard set. Since their introduction in 2005, Cleartone guitar strings have garnered rave reviews from beginners and industry professionals alike. Super-high tension winding over a hex-core is used to maintain tuning consistency throughout performance duration. EMP Treatment is then applied to all the strings (including the plain strings) to ensure the longest tonal life without compromises. 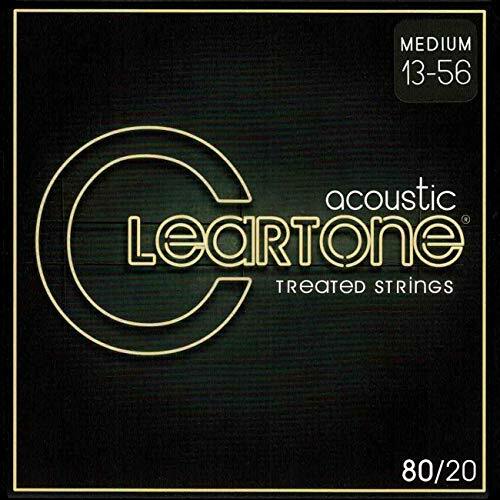 Cleartone 80/20 bronze acoustic guitar strings. 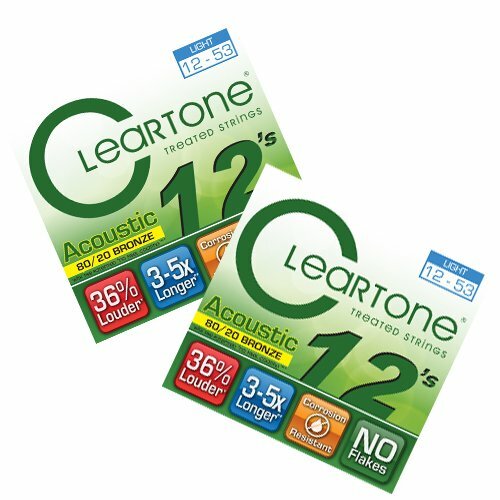 Model #7612Gauges: .012 .016 .025 .033 .043 .053.Cleartone Acoustic Strings may have a coating of only one micron, but it's more durable than coatings thousands of times its thickness. It won't flake off with hard playing, nor will it feel slick or slippery to your touch. Super-high tension winding over a hex-core is used to maintain tuning consistency throughout your performance. EMP Treatment is then applied to all the strings (including plain strings) to ensure longest tonal life without compromises.Package Contains 2 Packs of Cleartone Strings! Silky feel, brilliant tone, and incredible string life. Gauges: 10-10-14-14-23w-10-30w-13-38w-17-47w-26w. 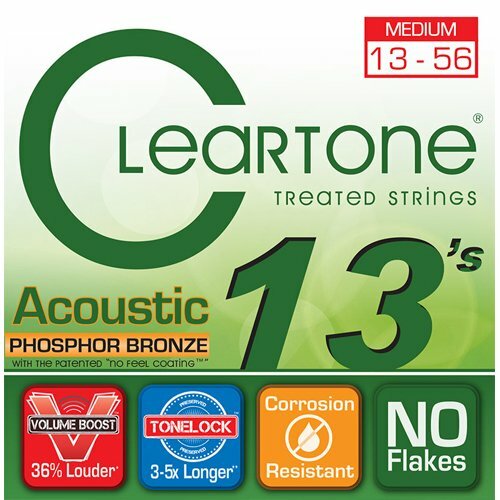 Cleartone 12-String Acoustic Guitar Strings feature the finest phosphor bronze available for the warmest and brightest resonance on acoustic guitars. A unique treatment called EMP coats the entire string with an ultrathin protective film. It's the thinnest coating ever applied to guitar strings (less than one micron!) and will withstand more abuse from hard strumming than coatings 1000 times thicker! EMP ensures longer string life by protecting strings from corrosion due to skin acidity, salt, and moisture without compromising feel and sound. Super-high tension winding over a hex-core is used to maintain tuning consistency throughout performance duration. 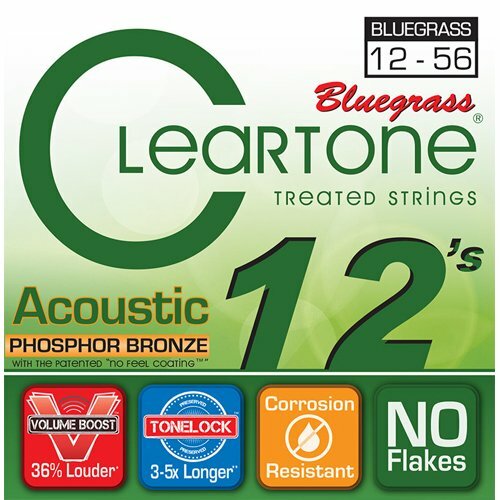 Cleartone phosphor bronze acoustic guitar strings.Model #7412 - Light Acoustic .012 .016 .025 .033 .043 .053Cleartone Acoustic Strings may have a coating of only one micron, but it's more durable than coatings thousands of times its thickness. It won't flake off with hard playing, nor will it feel slick or slippery to your touch. Super-high tension winding over a hex-core is used to maintain tuning consistency throughout your performance. EMP Treatment is then applied to all the strings (including plain strings) to ensure longest tonal life without compromises. 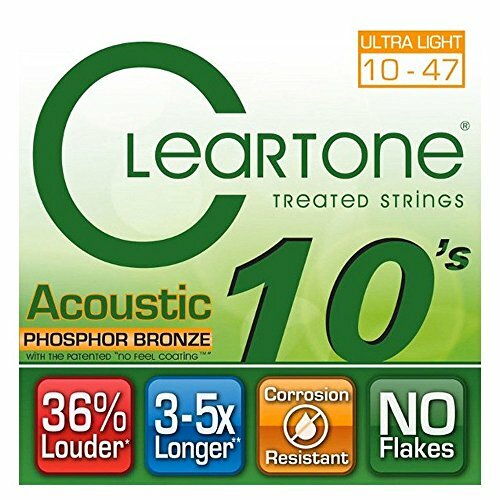 (Cleartone)Package Contains 2 Packs of Cleartone Strings! 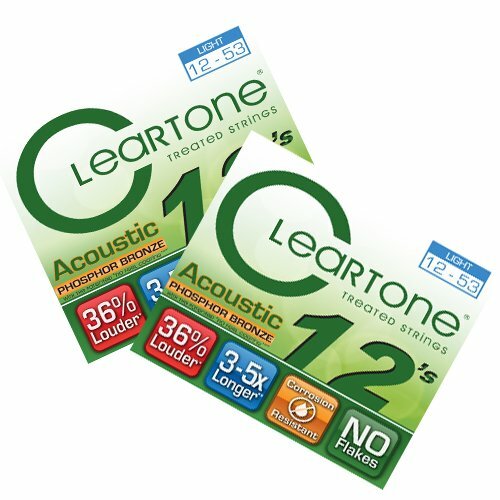 Shopping Results for "Cleartone Acoustic Guitar"